Viability PCR is a powerful technology for the sensitive and rapid detection of viable microorganisms. Unlike time-consuming culturing methods, qPCR is a fast and sensitive method of detection. However, normal PCR does not distinguish between live and dead cells. With v-PCR using PMAxx™ or PMA, you get the speed, sensitivity and specificity of PCR, plus quantifiable viability. And because no culturing is required, you can even detect viable but not culturable (VBNC) bacteria.The v-PCR technology can be applied not only to bacteria but to other organisms like yeast and viruses. PMAxx™ and PMA are photoreactive dyes with high affinity for DNA. The dyes intercalate into dsDNA and form a covalent linkage upon exposure to intense visible light. The reaction inhibits PCR amplification of modified DNA templates by a combination of removal of modified DNA during purification and inhibition of template amplification by DNA polymerases. Because the dyes are cell membrane-impermeable, when a sample containing both live and dead bacteria is treated with dye, only dead bacteria with compromised cell membranes are susceptible to DNA modification. In a real-time PCR reaction, dead cell DNA will show delayed amplification and higher Ct than live cells. In a mixed population, v-PCR permits quantitation of cell viability. 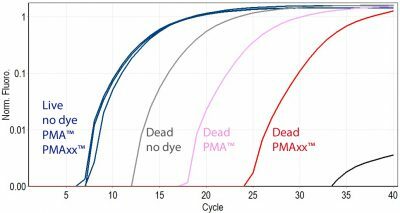 Principal of viability PCR with PMA or PMAxx™ dyes.The membrane impermeable dyes selectively enter dead cells and modify their DNA. Modified DNA is not amplified, allowing quantitation of viable cell DNA. Example of viability qPCR of untreated or heat-killed <em>E. coli</em>with PMA dye. PMA treatment eliminates dead cell DNA, resulting in a large delay in Ct compared to live or untreated cells. NTC: no template control. PMA is the original dye developed at Biotium for v-PCR. It has been validated in a wide variety of bacterial strains, as well as yeast and viruses (see PMA & PMAxx™ References and PMA & PMAxx™ Validated Bacterial Strains). However, while PMA is generally effective at differentiating between live and dead bacteria by qPCR, it does not completely eliminate PCR products from dead cell DNA. This could potentially give false positive results. PMAxx™ was designed by Biotium scientists to be a superior alternative to PMA. 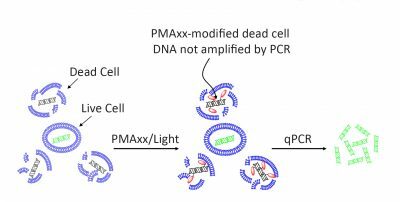 PMAxx™ is much more effective at eliminating PCR amplification of dead cell DNA, and therefore provides the best discrimination between live and dead bacteria. Download the PMA™ and PMAxx™ flyer to learn more. Live or dead bacteria treated with either PMA or PMAxx™ prior to qPCR. Dead bacteria treated with either PMA or PMAxx™ show delays in amplification compared to either live cells, or untreated dead cells. Bacteria treated with PMAxx™ show a larger delay than those treated with PMA. Therefore PMAxx™ is better able to differentiate live vs dead bacteria by viability PCR. The customizable Viability PCR Starter Kits contain the materials that you need for selective detection of viable cells using either PMA or PMAxx™ viability dye and qPCR. These kits can be used with any cell type of your choosing (see this Reference List and this Validated Bacterial Strains List for published validated cell types). All of the kits contain Forget-Me-Not™ EvaGreen® qPCR Master Mix, and your choice of PMA or PMAxx™ dye. You also have the choice of selecting a kit with or without the Enhancer for Gram Negative Bacteria (not to be used with other cell types). The user will need to supply their own primers to amplify their species of interest (see this blog post for primer design considerations). Each kit contains reagents sufficient to treat 80 bacterial cultures and perform 200 PCR reactions. PMA Enhancer for Gram Negative Bacteria was designed to improve discrimination between live and dead gram-negative bacteria during viability PCR. PMA Enhancer is provided as a 5X solution, and is added to a sample before the addition of viability dye. When a sequence from a gram-negative bacteria is amplified by PCR, samples pre-treated with Enhancer show a decrease in the signal from dead cells, with no change in the signal from live cells. PMA Enhancer is compatible with PMAxx™ as well as PMA. PMAxx™ plus Enhancer is the optimal way to perform viability PCR on gram-negative bacteria. PMA Enhancer is available as a stand-alone product, and is also a component of our PMA Bacterial Viability Kits (gram-negative strains only) (see below). 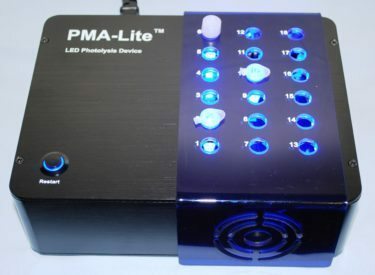 The PMA-Lite™ LED photolysis device allows for time- and temperature-controlled light treatment of PMAxx™- or PMA-treated samples in microcentrifuge tubes. 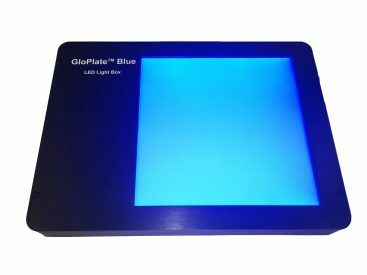 The Glo-Plate™ Blue LED Illuminator is designed for even light treatment of PMAxx™- or PMA-treated samples in plates or larger tubes. Strain-specific v-PCR kits are designed for selective detection of viable bacteria from a specific strain using PMAxx™ or PMA dye and real-time PCR. The kits contain PMA dye OR PMAxx™ dye, Forget-Me-Not™ EvaGreen® qPCR Master Mix, and validated PCR primers for detection of selected strains of bacteria that are of widespread interest to food safety, public health, and/or antibacterial research.